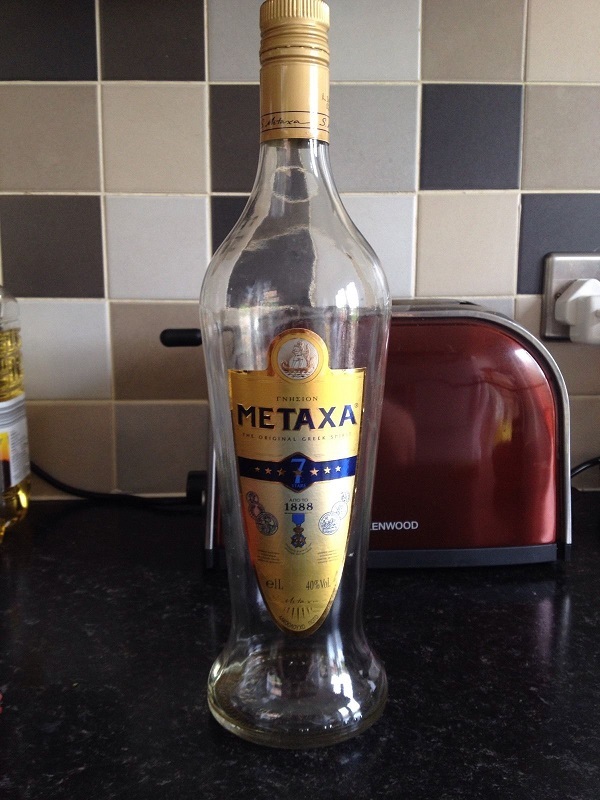 Metaxa bottles are clear, correct shape, if anyone wanted something close. 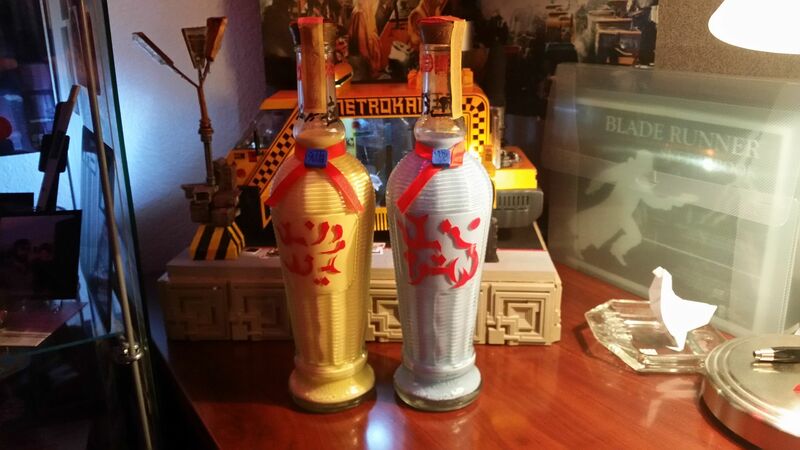 I finally finished the first two of three animoid row bottles. One more to go. A big "thank you" to all of you who contributed pictures and tips. This label says, "If you might be pregnant, think before you drink." But seriously, in the spirit of so many of the Blade Runner set dressings, it's a random assortment of hiragana, katakana, and kanji characters -- and it looks great! 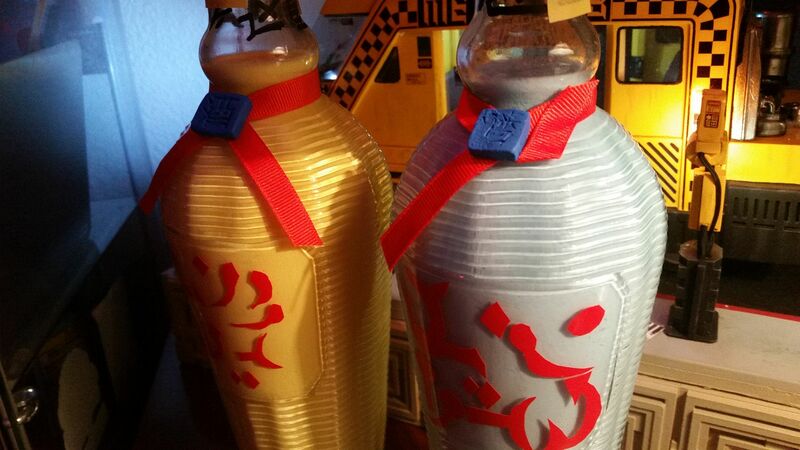 Very good teamwork on the bottles, with impressive outcomes. Thank you. I did indeed chose the different kanji, hiragana and katakana for their esthetic value, and not their phonetic/semantic meaning. I wish I had time to learn Japanese though. Such a fascinating language and culture. I hope to visit Japan again someday! I shouldn't have used the word "random" in my post, as I think you have high standards and figured that you must have selected those characters with some criterion in mind, most likely their aesthetic value. Perhaps "nonsensical" would have been a better choice of words. I don't mean that in a negative way. I mean it literally: these characters don't form any accepted, decipherable combinations -- but they do make a very cool-looking label for the bottle. Interestingly, many of the original Blade Runner props and set dressings that incorporate Japanese seem to have been made by taking sentences (rather than individual characters) from magazines and other sources, and then cutting them apart -- the result being snippets that may be grammatical and communicate the fragment of an idea, but that are incomplete, unrelated to the context of the prop, and thus, when scrutinized, nonsensical. Of course, the filmmakers never expected these props to be examined under a microscope the way that we do. You might consider coming to Japan in 2020. In addition to the usual pleasures, you'd be able to catch the Olympic Games. 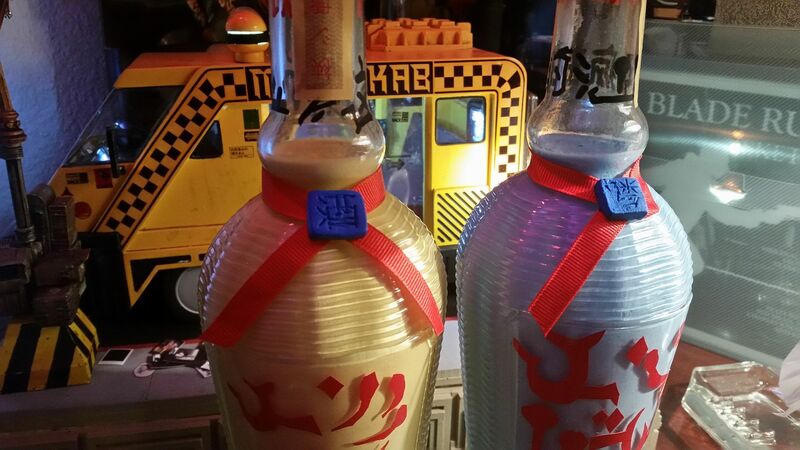 I chose for the handwritten areas near the top of the bottle characters that supposedly mean "bar", "crazy monk", "drunk munk" or "drunk monk's booze".